It is an acrylic copolymer warp sizing binder with high viscosity. The product may be used in combination with starch and starch derivatives for the sizing of cotton, polyester / cotton, polyester / rayon and other blended yarns to be woven on high speed weaving machines. 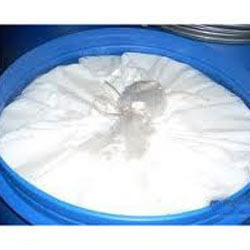 It may be also be used to replace polyvinyl alcohol in warp sizing formulations. Incorporated in the year of 1964, we, Indokem Limited, are one of the prominent and reliable organizations of the industry involved in manufacturing and supplying a vast assortment of Chemical & Dyes. Our provided products are formulated by taking optimum quality chemical compounds under highly controlled environments. Under this products array we are offering Textile Auxiliaries, Pigment Emulsions and Textile Chemicals. Our offered products are highly demanded by the various industries such as textiles, paper and leather for their effective performance and unmatched quality attributes. We are offering these products as our client’s detailed demands and needs to suit their requirements. We offer our products under the brand name Indowet, Indoclean, Indolube and Indosoft. We have established a highly advanced infrastructure unit. We have installed all the highly advanced and modern machines to prepare the offered product array. We adopt advanced instrumentation and process control measure for manufacturing process of provided products which resulted into higher yield and optimum quality besides providing safer and cleaner environment for our work force. Since our inception we are a customer driven and highly service oriented group, offering value added products consistently for our precious patrons.